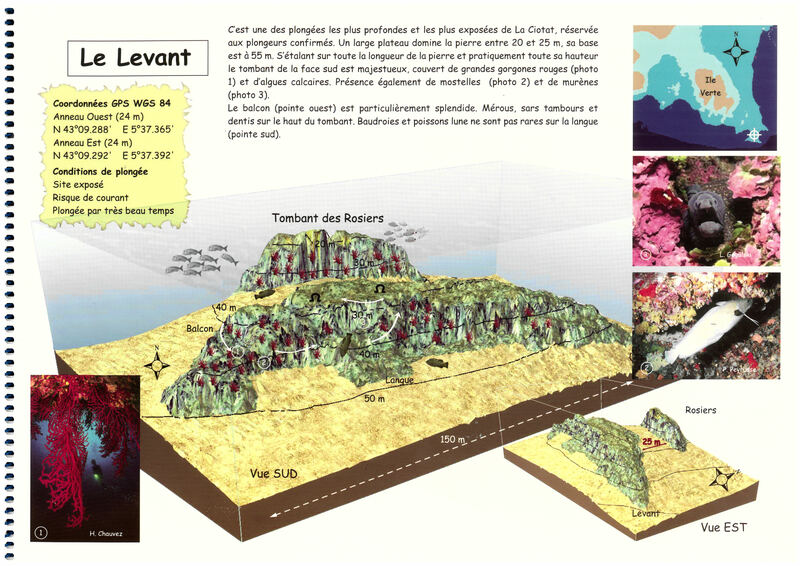 Le Levant :Diving conditions :exposed site , strong current , dive only in very good weather conditions. It is one of the deepest and exposed dives in La Ciotat , only for experienced divers.A large shelf overhangs the stone between 20 and 25 meters and its basis reaches 55 meters.The south drop-off that stretches all along the stone and practically along its height is majestic : it is covered with big red gorgonians (photo 1) and calcareous algaes . You can find forkbeards (photo 2) and morays (photo 3). The balcony (west end) is just exceptional.You can observe mérous (i.e groupers ) , big lips breams and dentis on the upper part of the drop-off.Anglerfish and sunfish (mola-mola) can be seen in the south end strip.